The Following was a brilliant and addictive series! Season one will still be my favorite and from there it went a bit downhill….just not so dramatically until episode 40! When it comes to ending a series, I have found that not many directors, writers, or really anyone, has the formula to give the perfect ending that will make fans of the series happy. The real quest, these days, is to create an ending good enough for the audience to accept it, and leave it open enough just in case any network might decide to revive it. That's pretty much what they did with Season Three of The Following! "The Following" is actually one of my favorite shows of the last few years. When I found out, 3 years ago, that I would be interviewing Kevin Bacon about his role in "The Following", I figured I better watch a little bit of the series so I know what to ask him. 24 hours later, I had completed all 15 episodes of season one! I was hooked! 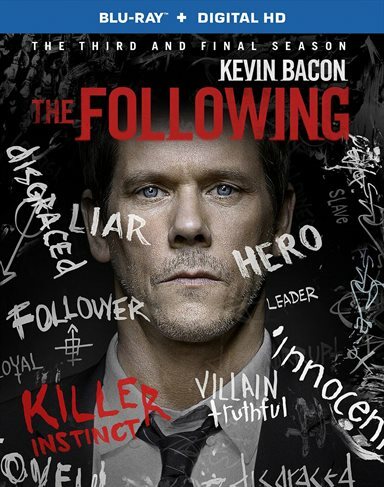 "The Following", if you don't know, centers around FBI agent Ryan Hardy (played by Kevin Bacon) who is trying to re-capture serial killer Joe Carroll (played by James Peurfoy). Now, Joe, while in prison, had created a cult-like following of like-minded individuals who were dedicated, heart and soul, to him and willing to kill, or die, for him! Joe and Ryan have, since the beginning, had this symbiotic relationship. Their fates intertwined. Hell, they even shared the same woman, Joe's ex-wife, Claire Matthews! Season one revolved mainly in re-capturing Joe with the help of fellow FBI agent Mike Weston (played by Sean Ashmore); which, if you've watched, you pretty much know how that turned out! The second season brought in a second cult lead by Lily Gray and her two sons, which didn't bring a favorable outcome for Mike Weston, and yet, season two ends with Joe Carroll being arrested. And now, we are up to this week's Blu-ray/DVD release of "The Following: Season Three"! Season three of "The Following" starts up one year after the arrest of Joe Carroll, who is now awaiting execution on death row. Ryan and Mike are being taunted by Lily Gray's remaining son, Mark, who after his loss of the rest of his family, seems to be suffering with dual personalities….or is just plain crazy, which is more likely the case. Ryan eventually goes to see Joe to ask for help finding Arthur Strauss (who is eventually killed by his best pupil, Theo, played by Michael Ealy), who ends up going after Ryan Hardy as well! It's in episode 10 where this series went off the deep end for me. In the end of the episode, the series takes a turn that I don't think many series can come back from. For 40 episodes, we have learned that Joe and Ryan are connected, and while Joe thinks Ryan needs him (and may be right on that point) Ryan has already been suffering nightmares & visions of Joe, and has come to the realization that they are connected on a deeper level. And then, they execute Joe Carroll! Yup I said it! 40 episodes and they kill one half of the duo that makes the series most intriguing! I have talked with others many times since this about other series going across the line. That invisible line where the audience wants something, or even reality dictates something that should happen that will irreparably ruin the series. It's the equivalent of rescuing the crew on Gilligan's Island, having Scully & Mulder hook up, or even Sam and Diane Chambers getting married. It's a strange thing for fans, and most likely even harder for the writers of the series, to recover from. It's like starting at the beginning with the underlying heart ripped out. After Joe Carroll's death, there was no saving this series……UNLESS they would go down a path that was already penned out. It looked to me as if they would do quite possibly the best thing ever in a series….turn it upside down and inside out! Ryan Hardy was already seeing Joe in his dreams, drinking again, his life was coming apart…turn him! Make him what he has hunted down! Ryan was already in the press and finding "Followers" would have been a breeze and would have let us have a chance to see Bacon turn to the dark side and go against Max (his niece) and Mike. But alas, it was not meant to be! I still finished "The Following: Season Three", and while the ending of the series wasn't what I had hoped for, and it was kind of a letdown, there really wasn't a good place to leave it other than what they did with it. And, I had even hoped that maybe they could take the previous idea of "Bad Ryan" and spin it off in a new series…….but who knows on that one. "The Following" was a brilliant and addictive series! Season one will still be my favorite, but, from there, it went a bit downhill….just not so dramatically until episode 40! Blu-ray features include Following Marcos Siega (Featurette), The Religion of Joe Carroll (Featurette), The Joe Mask (Featurette), Bonded by a Common Foe (Featurette), Inside The Following (15 mini-Featurettes), Severed Scenes, Season 2 Alternate Ending, Comic-Con Panel 2013. Also includes UltraViolet so you can enjoy the film on many different compatible devices. If you haven't seen the series, I totally recommend it. Get back to me after you finish season three and we can talk! I give Season three of "The Following" 3 serial killers out of 5! It would have been 4 if you didn't kill Joe! Download The Following: The Complete Third Season from the iTunes Store in Digial HD. For more information about The Following visit the FlickDirect Movie Database.